Abandoned vehicles along the CANOL Road. 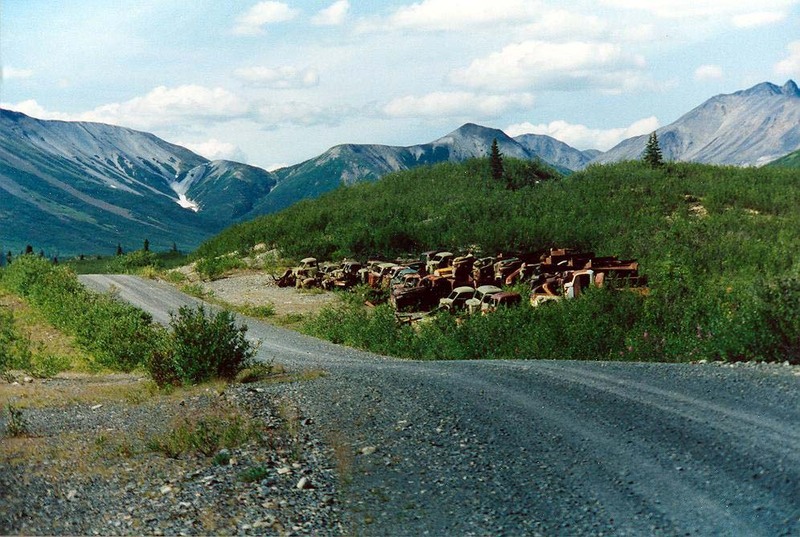 The CANOL Road and pipeline was built as an adjunct to the AlCan highway during WWII. The pipeline was to carry crude oil from the oil fields near Fort Norman, NWT, to Whitehorse. The crude was to be refined in Whitehorse for use along the AlCan. The pipeline was completed and some oil refined before the decision was made that the whole thing was unnecessary and all facilities between Johnson Crossing (south of Whitehorse) and Fort Norman were abandoned, including the vehicles shown here, as it was deemed not economically feasible to haul them out as surplus. Local residents were also forbidden to salvage them.